Below is a press release from Hibernian FC regarding changes t their Development Squad. Within that is news of DB Sports Tours’ starlet Ruari Paton. Hibernian can confirm that a number of academy players have signed contract extensions with the club. Scott Martin, Callum Crane, Oli Shaw, Ryan Porteous, Fraser Murray and Ben Stirling have all signed new deals to continue their development at Hibernian. Martin, 19, has played four times this season, starting the opening daywin over Falkirk before breaking back into the team during the festive period. Crane, 20, impressed at left back during pre-season and has featured on the first team bench on several occasions in 16/17, starting the Irn Bru Cup tie with Turriff United. Shaw, 18, has enjoyed a successful campaign so far, featuring for the Scotland under 19s on a regular basis and playing with Stenhousemuir in Ladbrokes League One. He will continue on loan with the Warriors until the end of the season. Porteous, 17, has been a mainstay at centre-half for Edinburgh City in Ladbrokes League Two this season, and will remain with the Meadowbank outfit for the rest of the campaign. Murray, 17, marked a dream debut for the first team with a goal against Turriff United, and has performed well for the table-topping Development Squad. 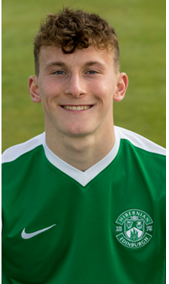 Stirling, 18, can play a variety of positions in defence and midfield, and spent the first half of the season on loan at Berwick Rangers. Hibernian can also confirm the additions of striker Ruari Paton and goalkeeper Maciej Dabrowski to the Development Squad. 16-year-old Paton played as a trialist for the Development Squad earlier in the season, scoring twice against Motherwell. 18-year-old Dabrowski has signed for Hibernian from Lech Poznan on loan until the end of the season. Aaron Dunsmore’s loan spell with Edinburgh City has been extended until the end of the season, and Ali Smith has joined up with Vale of Leithen for the rest of the campaign. Ben Stirling and Sean Mackie have completed their loan spells at Berwick Rangers and return to the club, while Adam Watson and Kevin Waugh return from six month spells at Gala Fairydean.